You’re invited to Easter at The Village! Easter is a special time for family, friends, traditions, and celebration. Life Change, Life Growth, Life Purpose is what we want for you. Build a relationship with Jesus while serving others. It’s that simple. The Village is a non-denominational Christian church – that means all backgrounds are welcome here (Catholic, Methodist, Lutheran, Protestant, even atheists) whether you’ve never been to church, haven’t been in a long time, or have been a part of a church all your life. Our church isn’t a building, it’s a group of people who love Jesus and each other. We look to find ways to apply the Bible to our lives and let scripture be our guide. If you’ll be visiting, use the button below so we can be ready for you. Thursday, 4/11 & Sunday, 4/14: Palm Sunday Services celebrating the week before Easter that begins Holy Week and the day Jesus entered into Jerusalem. 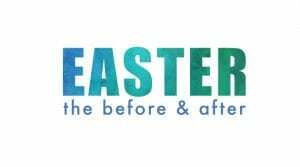 Thursday, 4/18: “The Before”, A special Thursday service will look at the events leading up to Easter. Sunday, 4/21: “The After”, Celebrate the greatest story ever written and discover the hope He brings this Easter. Each of these services will be different and we encourage you to come to all 3. Kid Village rooms (infant – 4th grade) will be open for the Thursday 6:30 pm services and Sunday 9:30 and 11 am services. Kid Village will be closed for the Sunday 8:30 am service. Pulse Jr. & Sr. will not meet Sunday, April 21st. Arrive early to get your seat. Please sit towards the front and fill in all the seats in your row. We’re excited to see you, your family, and your friends!